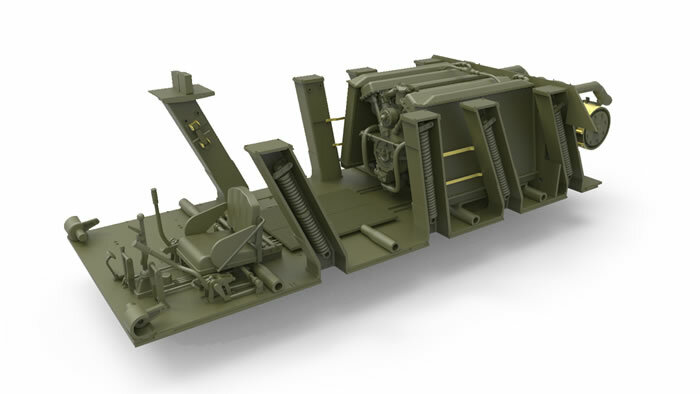 Advantages: Nice new mold kit of this famous antitank gun; full interior with several options. Recently I received a copy of “Sverdlovskiye SUshki” which is the factory history of Soviet SP guns starting with the SU-122. It recounts how the Urals Factory for Heavy Transport Machinery Construction (UZTM in Russian) only came up in conversation as a possible tank factory in the late 1930s. Up until that point it had only worked on heavy construction equipment. But with the assignment of L.S. Vladimirov as director (who had worked closely on the BT-2 tank at Kharkov) things began to change. With B.G. Muzrukov taking over in 1939, the factory began to move to the fore and was first tasked to make KV-1 hulls in 1941; then later it was refocused on T-34 hulls. While they initially decided to make T-34 tanks, in November 1941 they were ordered to coordinate with Plant No. 9 (artillery) to work on artillery tanks for the Red Army. L.I. Gorlitskiy was assigned as the chief designer of this class of weapons. 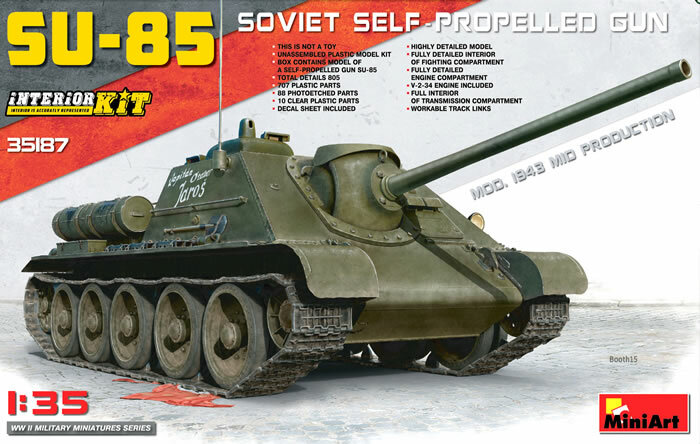 After the factory branched out on its own and produced the SU-122 self-propelled howitzer, in 1943 the Red Army noted the Germans were upgrading all of their weapons systems and soon their powerful 76mm guns would not be able to take down German armored vehicles. Kursk was an object lesson for the General Staff and they took it to heart. The SU-122 was a great close support vehicle but its low-velocity 122mm round was not effective beyond 500 meters on tanks. 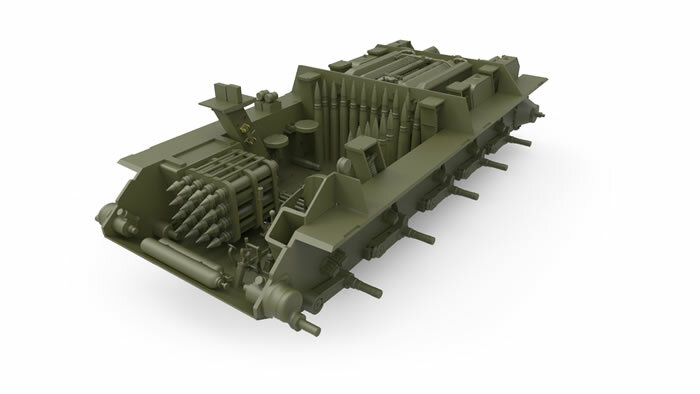 So a new tank destroyer was to be created using the SU-122 chassis. 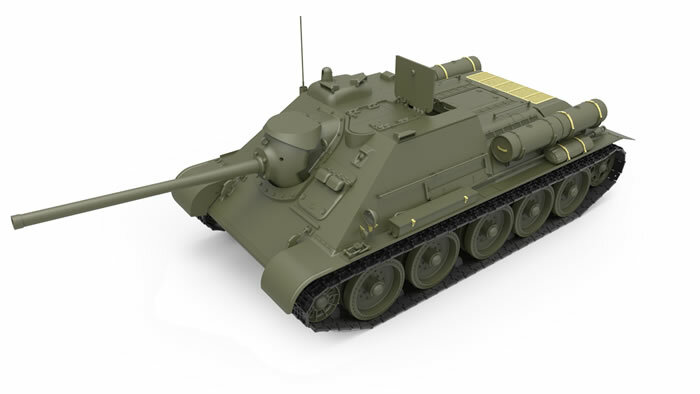 After suggestions to use a 57mm gun or even an experimental 95mm one, the decision was made to create a tank gun based on the 52-K 85mm antiaircraft gun, with F. F. Petrov offering up the D-5S85 and V.G. Grabin the 85mm S-18. The D-5S85 was deemed the best of the two and was adopted for the new gun, now dubbed SU-85. Production began in August 1943 but the need for the D-5S85 guns outstripped the production capability at Factory No. 9. Some xxxx were built between then and September 1944 when the SU-85 was completely replaced in production by the even more powerful SU-100; the T-34-85 tanks had come into full production early in 1944 and obviated the need for it. Around 2,050 of all models were built with the last ones being the SU-85M that shared some design features with the SU-100. Roughly 40 years ago Tamiya introduced the first kit of the SU-85 available in styrene, but it shared a poor chassis with their T-34 tank kits of the day. About 15 years ago DML released much better kits of the SU-85 and SU-85M, but they had some problems as well. 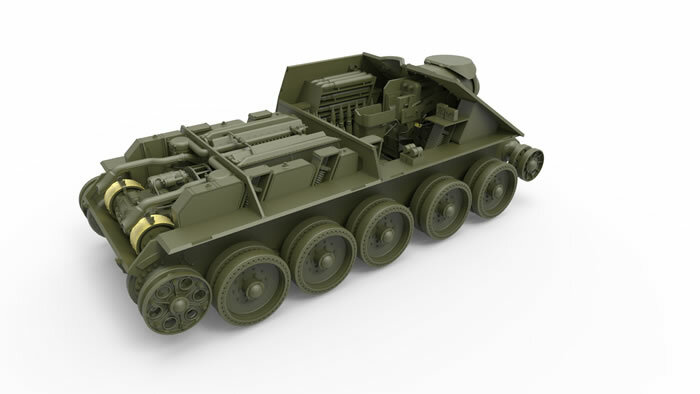 Miniart has released a new mold kit of the vehicle that shares part of its design with their recent SU-122 kits (as did the original!) The result is an excellent kit. Like the earlier kits this model seems to match up reasonably well with the blueprints with some differences in the spring tower locations and the firewall, but none of these seem to have a major impact on the overall accuracy of the kit (especially if the hull is cemented together and only hatches are left open for viewing the cramped interior!) While much comes from the SU-122 kit this has 224 new styrene parts and a new fret of 116 etched brass parts. Note that the kit is typical of recent Miniart efforts with the kit on some 75 sprues and one fret of etched brass. The directions are as with all recent Miniart kits a handsome booklet with clear locations called out for all parts. As with previous new released Miniart kits assembly starts with the V-2 engine. Only the injector tubing seems missing from the engine as it comes with all of the other items including radiator balance pipes and fittings. The transmission includes the shift linkages and all accessories such as the generator/starter. The brakes have a correct “ribbon” from etched brass and the proper actuating gear. However, all of the control rods are molded to the belly plate (B2) and not separate; considering they are on the floor of the hull this is not a big whoop. This vehicle has the “Tsiklon” air cleaners and the kit does a nice job of representing them to include etched brass latches. Some modification needs to be made to the intake tubes (Da1/Da2) due to this particular air cleaner setup (as shown in the directions). Each spring tower has a separate spring and adjustment mechanism inside it. While the road wheel arms have the same round pins for mounting which made the SU-76M kit a pain to assemble, these also have locks on one end (F5) and fit into the springs to lock them in place so a pretty positive fit and result. The front spring mounts are quite complete and each one consists of some five parts. Step 41 basically completes the lower hull, and then the construction switches to the D-5S85 gun. If assembled correctly the gun will elevate and traverse within the limited arc that the original gun possessed. Also note the main item of the interior is ammunition - the kit provides the authorized 486 complete rounds plus some other elements stowed inside the rather cramped interior. (Realize the original had a crew of five inside there with the gun and all of that ammunition...). The last parts of assembly cover the rear upper hull and fenders as well as the engine deck. They provide both a complete etched radiator exhaust grille (the big one at the rear of the engine deck) or a single part “quickie” solid styrene one. 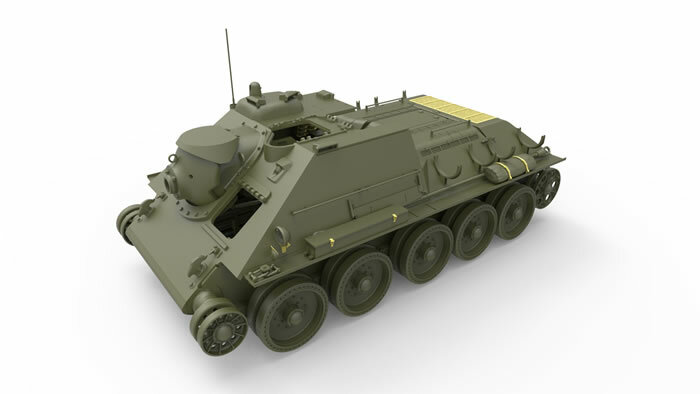 When completed the rest of the model is then assembled to include mudguards and external items such as the auxiliary fuel tanks. Note that the indirect fire panoramic sight is included and it can be mounted sticking out of the open gunner’s hatches if desired. Finishing instructions cover only two SU-85s: an unidentified unit, Red Army, winter 1943-44 (4BO green with whitewash and red 214 or 4BO with white 214); 1st Czech Armored Brigade, 1944-1945 (4BO green with white logo “Kapitan Otacar Jaros”). A good-sized decal sheet is provided for these markings. This was a bit surprising as with three times more built (plus postwar “trickle down” to client states) you would think they would have more options. 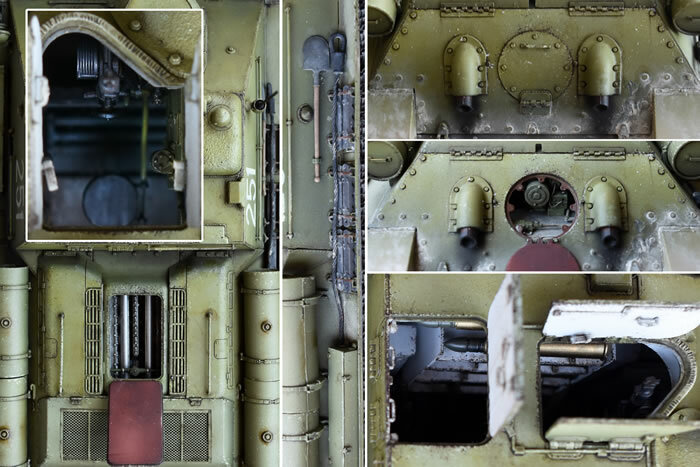 Overall like the SU-122 with interior it almost is a shame to complete as is and seal up all of that detail inside it!